Epidermal growth factor receptor (EGFR) mutations have been detected in approximately 10 % of North American patients diagnosed with non-small cell lung cancer (NSCLC). Approximately 90 % of these mutations are exon 19 deletions or exon 21 L858R point mutations. First- and second-generation EGFR tyrosine kinase inhibitors (TKIs) are approved as first-line therapy based on clinical trials demonstrating superior response rates, progression free survival (PFS), and overall survival (OS) compared to chemotherapy in patients with EGFR mutation-positive NSCLC treated with an EGFR TKI prior to chemotherapy. However, the majority of patients treated with an EGFR TKI develop resistance to therapy within about 12 months, approximately 50 % of patients due to a second site mutation, the T790M mutation occurring within exon 20. At the time of progression, the EGFR TKI is most commonly discontinued and a different systemic therapy is initiated. However, oncogene addiction persists and recent exciting data with third-generation EGFR TKIs suggests that acquired resistance may be surmountable. The newest EGFR TKIs have shown activity against EGFR-mutant NSCLC after progression on first-generation TKIs, including those with T90M, while sparing wild-type EGFR and hence appear to be both well tolerated and efficacious. At this time, it appears that third-generation EGFR TKIs are effective following first-generation therapy, and determining the most appropriate sequence to maximize overall survival is a matter of ongoing investigation. 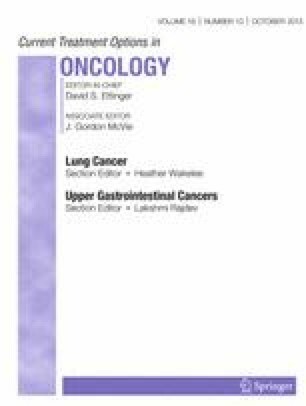 As the arsenal of active agents in EGFR mutant NSCLC grows, future research into potential combinations, optimal timing, and resistance mechanisms of these new treatments, as well as their possible role in the adjuvant, post-chemoradiation, and neoadjuvant settings holds great promise for this group of patients. Emily Castellanos declares that she has no conflict of interest. Leora Horn has received compensation from Genentech and Merck for service on advisory boards, has served on an unpaid advisory board for Bristol-Myers Squibb, as an unpaid consultant for Xcovery, and as an unpaid steering committee member for Bayer.